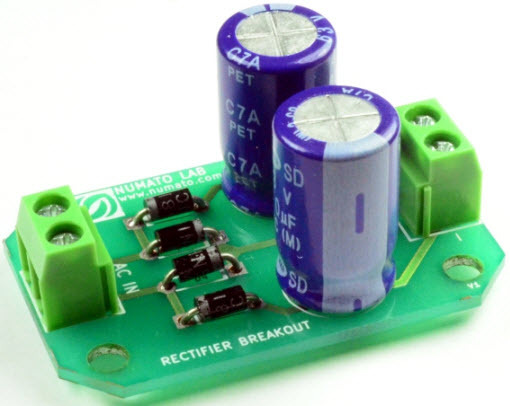 As a common part of all the electronic power supplies circuits, rectifier circuit provides DC power supply from available AC supply for proper function of electronic equipments. Depends on the type of application, this rectifier configuration and types are varied like diode rectifiers and phase controlled rectifiers, etc. but each one has their own advantages and disadvantages. The rectifier circuit can be implemented with different solid state electronic or electrical components like diodes, SCRs, MOSFETs and so on. Upon these components used rectifier operation is varied in order to get the required output. Before going to know its types let us know what is a rectifier in brief. A rectifier is a circuit that is used for converting AC supply into unidirectional DC supply. This process of converting alternating current (AC) to direct current (DC) is also called as rectification. These bridge rectifiers are available in different packages as modules ranging from few amperes to several hundred amperes. 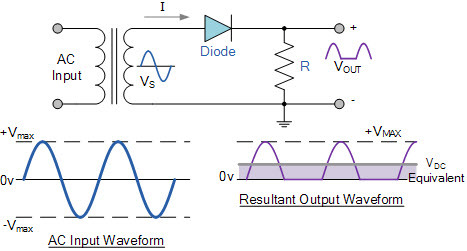 Mostly in bridge rectifier circuits, semiconductor diode is used for converting AC since it allows the current flow in one direction only (Unidirectional device). Bridge rectifier selection depends on load requirements and apart from this some more consideration are component ratings, breakdown voltage, forward current rating, transient current rating, temperature ranges, mounting requirements, etc. We can connect the diodes in different configurations for obtaining different types of rectifiers. Rectifiers are classified into a variety of configurations as shown in below figure. Depends on factors like type of supply, bridge configuration, control nature, components used, etc these rectifiers are classified. Majorly rectifiers are classified into single phase and three phase rectifier and these are further classified into uncontrolled, half controlled and full controlled rectifiers. Let us see in brief about some of these types of rectifiers. This type of rectifiers uses the uncontrolled diode for rectifying the input AC supply. At the output terminals of this rectifier, power becomes constant and changes of its magnitude or value depend on load requirement is not possible. It is a simple type of rectifier made with single diode which is connected in series with load. For small power levels this type of rectifier circuit is commonly used. 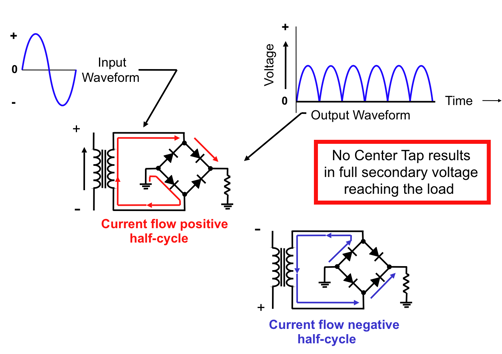 During the positive half of the AC input, diode becomes forward biased and currents starts flowing through it. During the negative half of the AC input, diode becomes reverse biased and current stops flowing through it. Output waveform across the load is shown in figure. Because of high ripple content in the output, this type of rectifier is seldom used with pure resistive load. This type of rectifier uses two diodes and a transformer with center tapped secondary winding. 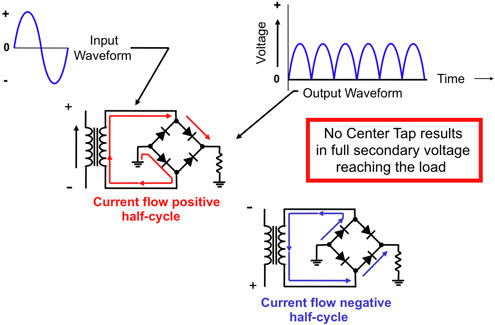 During the positive half cycle of the input AC diode D1 is forward biased and the current starts flowing to the load through it. During the negative half of the input diode D2 forward biased and D1 becomes reverse biased. Load current start flowing through D2 during this negative peak. Note that the current flow through load has not changed even when the voltage polarity changed. Advantages of this rectifier are lower ripple factor and higher efficiency, but the necessity of transformer with center tapping secondary is the main disadvantage and makes a circuit as costlier. Using the same secondary voltage, this bridge rectifier can produce almost double the output voltage as compared with full wave center-tapped transformer rectifier. During the positive half of the input AC diodes D1 and D2 are forward biased and D3 and D4 are reverse biased. Thus load current flows through D1 and D2 diodes. During the negative half cycle of the input diodes D3&D4 are forward biased and D1&D2 are reverse biased. Therefore load current flows through D3&D4 diodes. Controlled rectifiers use Thyristors in place of diodes to control the output. By adjusting the triggering time of Thyristors (or MOSFETs and IGBTs) we can control the voltage and current through loads and this process is termed as a phase control method of rectification. The circuit of single phase half controlled rectifier is shown below where it uses two diodes and two thyristors which are connected across the load. Each leg consists of one thruster and one diode and for every conduction, two leg components are responsible. However thyristors T1 and T3 or diodes D2 and D4 cannot conduct simultaneously . During the positive half cycle of the input, T1 and D2 are forward biased. When T1 is fired, then the load current flows through T1 and D2. If the voltage passes through negative going zero crossing of the input voltage, D4 comes into conduction by commutating D2 and then the load voltage becomes zero. 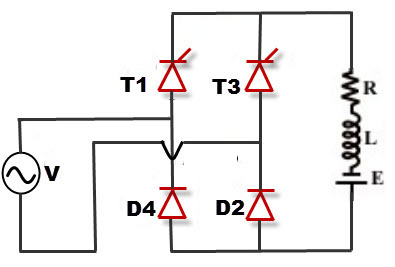 During the negative half cycle, T3 and D4 are forward biased and when T3 is triggered load current start flowing through T3 and D4. Similarly, at the zero crossing D2 comes into the conduction by commutating D4. As we can observe in below figure that the load current always remains above zero is termed as the continuous conduction mode of rectifying DC. Also discontinuous mode of operation is shown in figure. This type of power electronics based rectifier circuit is most popular one and widely used in controlling speed of the DC motors. This circuit is obtained by replacing all the diodes used in uncontrolled or half controlled rectifiers with thyristors as shown in figure. 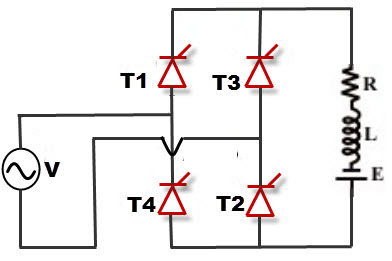 From the circuit, we can observe that one thyristor from a top group (T1, T3) and one thyristor from the bottom group (T2, T4) must conduct for load current flow. However T1T3 or T2T4 cannot conduct simultaneously. 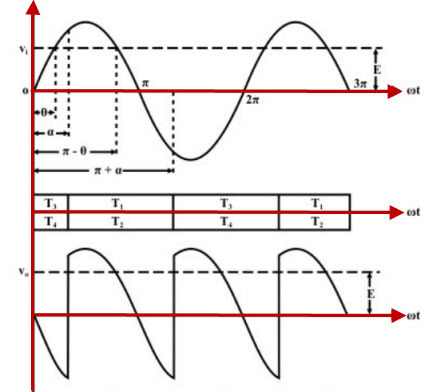 During the positive half cycle of the input signal T1 and T2 are forward biased and when these are triggered or fired these are starts conducting so that load current flow through them. 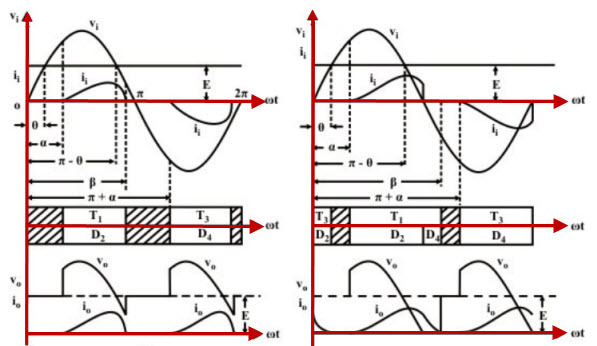 During the negative half cycle of the input AC, T3 and T4 are in the forward blocking state and when a gate pulse is applied to them, they will turn ON and load current starts flowing through them. At the same time, across T1 and T2 a negative voltage causes to the commutation of these thyristors immediately. This process repeats for every cycle as shown in below figure. These are the few types of rectifiers used frequently for several applications including all electronic and electrical projects. This article discussed only single phase rectifier for easier understanding and not to make this document as complex one. We hope that readers might have got a better answer for the question what is a rectifier and its types. Any further queries regarding this topic or practical guidance of building electronic projects you can comment below. Can you provide me details on Single Phase Bridge Rectifier Module? Hi Linber, sorry to say this we don’t provide you.